I’m a fan of the Tiny Home Movement, which advocates living simply in smaller homes. As in 400 sq ft and smaller. A friend that I camp with, Laura Lavoie, lives with her husband and cat in a 120 square foot home. I’m not kidding. 120 sq ft. I have a tent with more square footage than that. Tiny homes are homes, though, and isn’t camping. Yet tiny homes and glamping have much in common – both demand really good design to find a way to make a small space comfortable, efficient, and attractive. When I’m looking for solutions and ideas to camping frustrations, the Tiny Home Movement is one place I draw inspiration. And now, it appears, some tiny homers may draw inspiration from me. And you. Laura Lavoie and Drew Odom, invited me to be on their podcast Tiny r(E)volution to talk about glamping, my book, and I made a special announcement. Oh, and some fun for you to join into on twitter, too. We discussed how hospitality and graciousness are infused in the glamping and tiny home communities. Both represent a push back against the idea that everything is disposable. Of course we go over tips and products, but it was a happily organic conversation that I think you’ll enjoy. 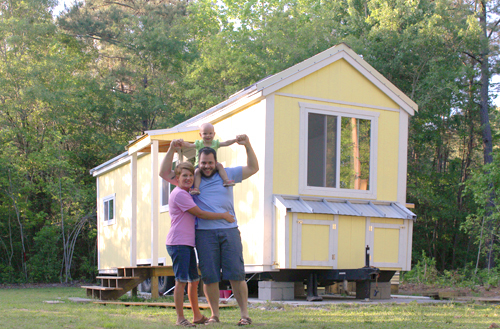 Tiny housers can learn about glamping, glampers can learn about tiny houses. Drew and Crystal Odom (and their daughter). The special announcement is towards the end of the podcast, but I can tell you about the fun we can have on twitter. Drew asked his listeners to post photos of their tiny bars on twitter and hashtag them #tinybar. 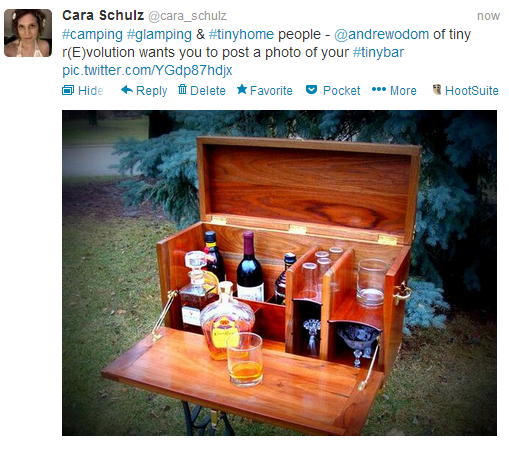 I know many of you do amazing bar set ups when you are camping, so post your photos with the hashtag, too. Mine is below. Absolutely! The tiniest room in our house is my studio. I enjoy the challenge of making it work!